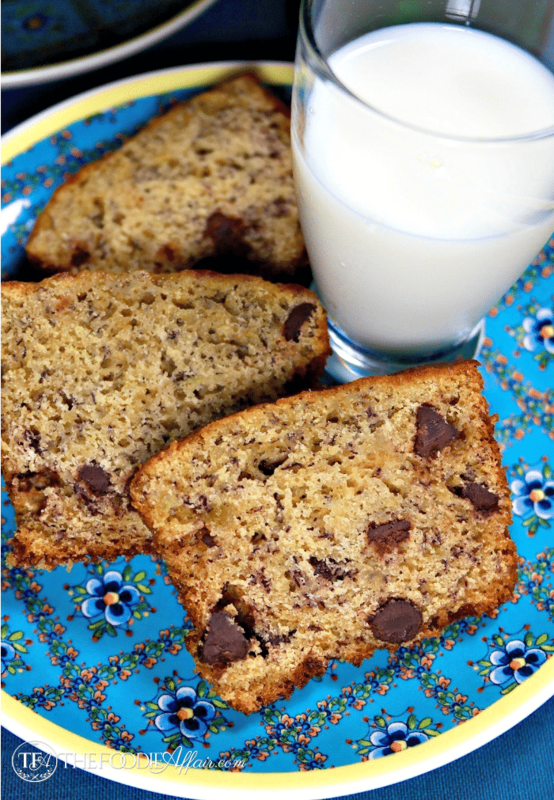 Use up your ripe bananas and make Banana Bread with Chocolate Chips for a tasty snack. Make one loaf or three mini loaves that can easily be shared! I made this bread with Max in mind. Max is one of our neighbors. A sweet man probably in his mid eighties that lives on the street right behind us. We see him practically every day when we take Abby on her walk. Alan does the pup stroll Monday through Friday and I join on the weekends. We walk right by Max’s front window on our way to the forest area near our house. He has his chair faced at just the right angle to see who is coming and going through his front window, and will get up to chat with us for a bit when he sees us. He likes Abby and offers her a bacon treat which she devours! We get worried about him if we don’t see him for a few days or if we notice his outdoor light isn’t on in the evenings. He tells us that his kids live nearby, but they don’t visit often. His ex-son-in-law visits though and we notice other people stopping by. He doesn’t express bitterness or even show a hint of sadness when he talks about his family. He says it got to be too hard on his kids to see their mother deteriorate into another person. The result of Alzheimer or dementia. I can’t remember which. Maybe both. Can you be diagnosed with both? Anyway, he said, “I can’t blame them for not coming by!” and then went on to say that his wife put up with him for over 40 years and he’ll do everything he can to keep her comfortable at home! Gosh, what a sweet man. That exchange brought a lump to my throat. Max laid his wife to rest this past month. He says he’s relieved because she is at peace now. I do see that he is at peace as well. When I brought him one of these banana loafs he said, “You’re going to get me fat!” I told him that was ok because I can’t get fat by myself! The next day he thanked me again for the the bread and said it was delicious! I pointed out to him that he was the same slim size! This recipe makes one regular size loaf or you can make three mini loafs which are the perfect size for sharing! Pre-heat oven to 350 degrees. Spray loaf pan (s) with non-stick baking spray or grease pans with butter and flour. Set aside. In a small bowl whisk together flour, baking powder, baking soda and salt. In a large bowl beat butter until fluffy. Gradually add sugar until well incorporated. Add eggs one at a time and beat thoroughly. Add bananas, lemon juice and vanilla extract. Beat in flour mix into butter mixture. Place batter into prepared loaf pan(s). Bake one large loaf for 60 minutes. Small loaves will bake for 30-35 minutes or until tooth pick inserted in the middle comes out clean. Remove from oven and let cook for 10 minutes. Remove from pan and cool on wire baking rack. I need to make a loaf ASAP! 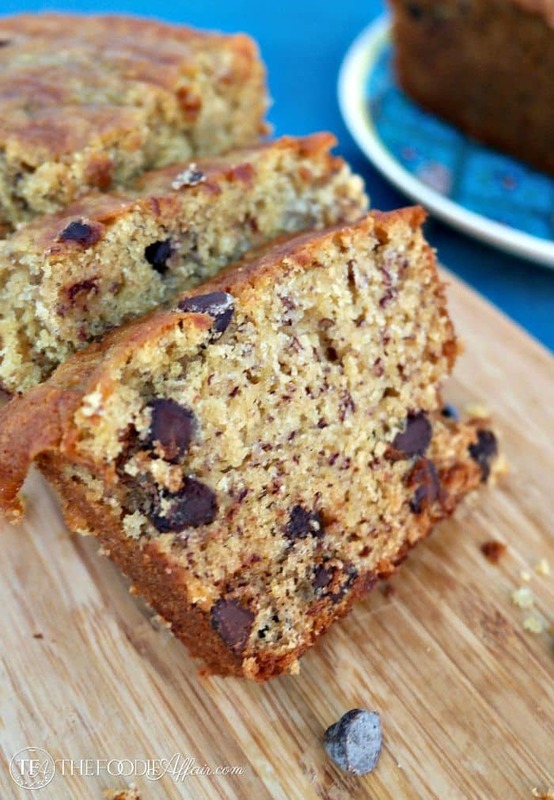 Love banana bread but never tried it with chocolate chips before – can’t wait! You will love the added semi sweet chocolate bits! Enjoy!! Banana and chocolate were meant to be eaten together! These look so good! I need to bake some up today! Yum! You can’t beat chocolate and banana together. I know this is a recipe we’d all adore. This is a bread that goes fast, especially right out of the oven when it smells so delicious! What a kind thing to take some banana bread to your elderly neighbor. I would be willing to bet he hasn’t been eating properly with all the stress of caring for and ultimately losing his wife. Making smaller loaves are perfect for gift giving. Making the small loafs is how I bake most of my breads. It’s fun to share and like I said, I can’t get fat alone haha! I would happily go for a slice of that this morning actually. I love bananas and chocolate together! Aren’t the two a tasty duo! I couldn’t let our ripe bananas go to waste. 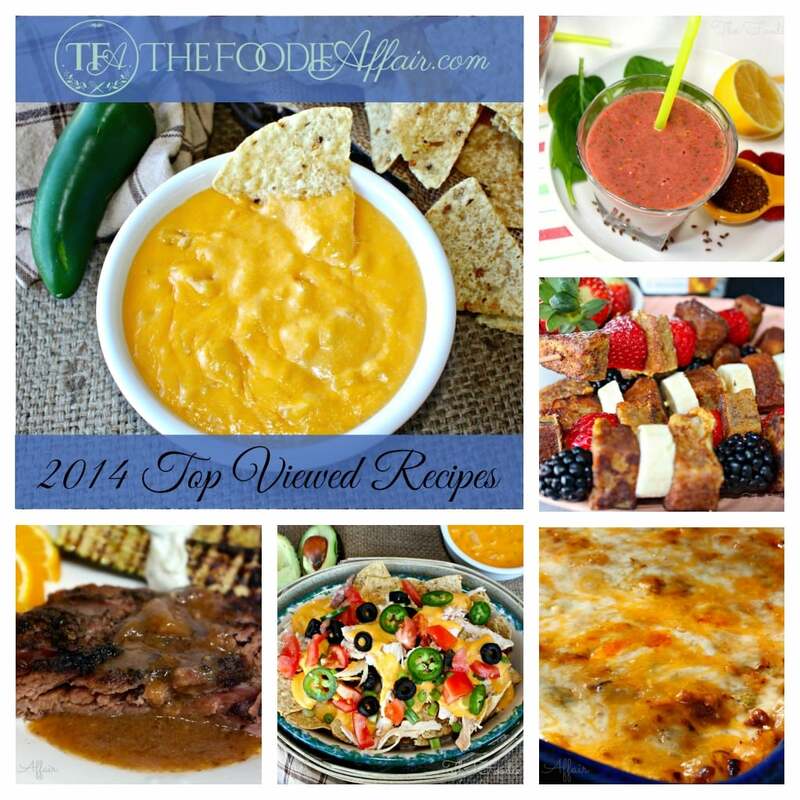 My mother-in-law makes zucchini bread very similar to this. Chocolate chips and all! 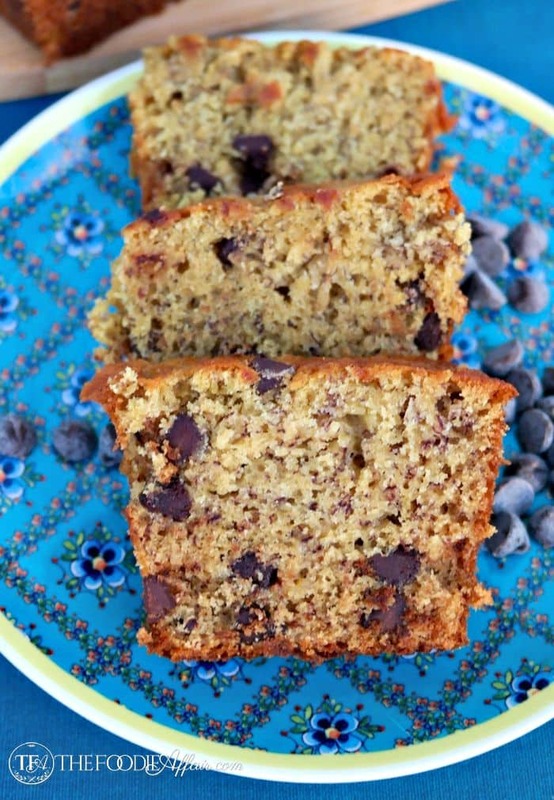 I’m such a sucker for banana bread but put some chocolate chips with it and yum! I wouldn’t be able to resist! You and me BOTH! Well, anything with chocolate is my kryptonite! What a sweet and delicious bread and story. I know how difficult it can be for the elderly and every day can be a challenge so thinking of them by sending some little treats just made their whole week so much better. Pinning! I sure hope this bread brought a little sunshine to his day! He’s really a joy to talk to. I like hearing about what he did in his younger years! That was so sweet of you. I bet you made his day. Sometimes it is the little kindnesses that people show that mean the most. Wow would I like a bi slice of that right now! Yum! I know! Totally wants to jump right in front of you to pick at those chocolate chips, right?! Such a sweet gesture for your neighbor! 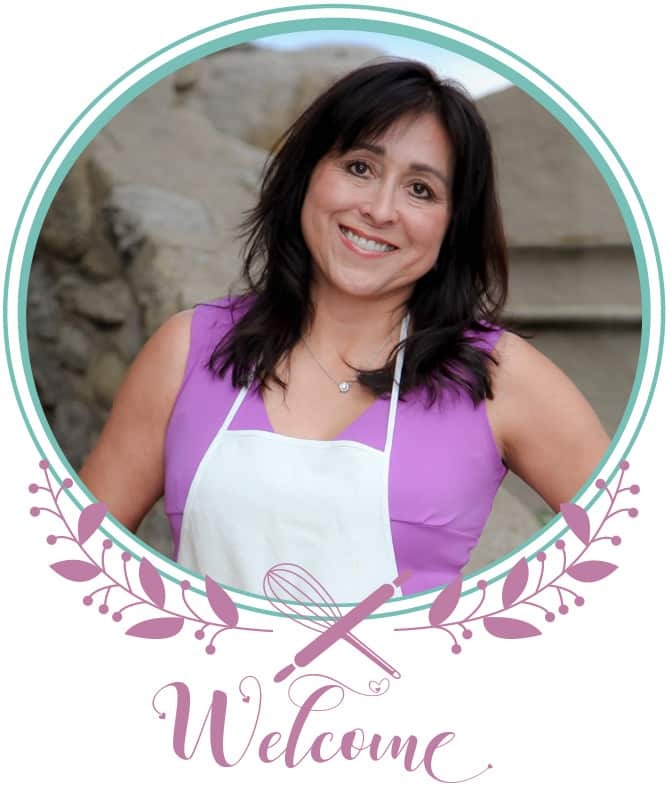 And a great recipe – I particularly love that you used white whole wheat flour. Love the stuff. Also, the little bit of lemon juice. LOVE that – I’m going to try that too. Great recipeee! 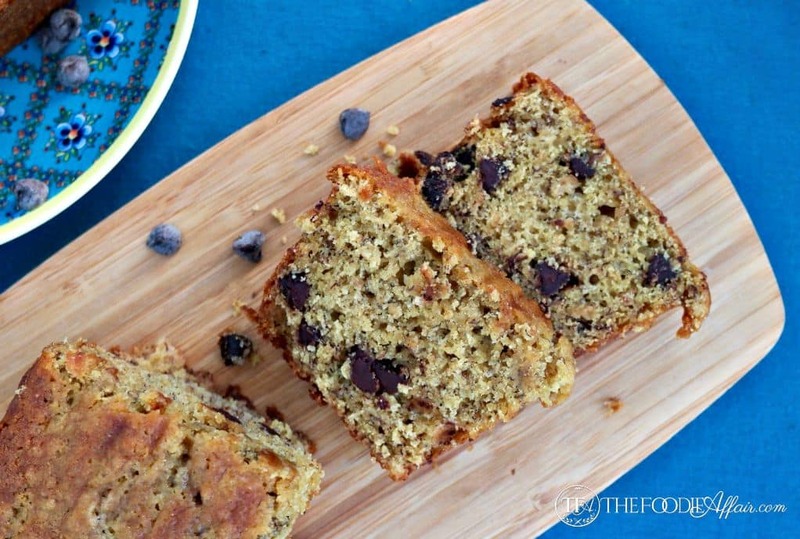 I make this banana bread at least once a week. It’s very easy and my family loves it. So glad to hear this is a fam favorite! So gooood!